Our guest blogger, Saengmany Ratsabout begins this week’s series on the Lao New Year with Part 1 – Myth of the Nang Sangkhan. 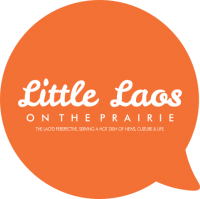 As we approach Lao New Year, I wanted to take this opportunity to not only highlight traditional practices associated with the celebration, but also begin a conversation on the relevancy of centuries-old traditions in twenty-first century Lao American communities. As we begin this conversation, there are three things I will focus on: 1) an overview of the three-day celebration including myths associated with the Nang Sangkhan, 2) Lao New Year as practiced by Lao Americans through archival research and personal anecdotes, and lastly, 3) relevancy of the myths and practices in the twenty-first century through a community development perspective. Nang Sangkhan in Laos. Photo courtesy of Reuters. The three day festival most visible activity consists of pouring water over people whom pourer wishes to bless. The water pouring signifies goodwill, compassion, well-wishes and reverence. 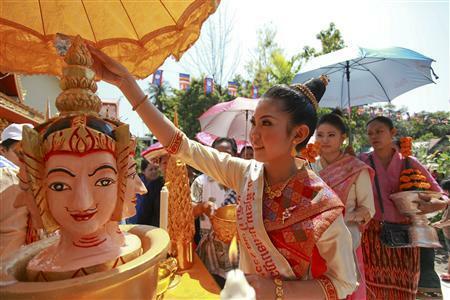 The first day of the celebration is called Sangkhan Luang, it is the last day of the closing year and known as “cleaning day”. Cleaning day consists of cleaning one’s home, community (temple, churches, family altar, etc…), settling old debts and obligations, all of which are symbolic forms of purification in preparation for the New Year. The second day of celebration is known as Sangkhan Nao. It is the day between the old and the new year, one day of rest while work is forbidden. One should avoid extensive travel, as the Khouan (vital souls) are particularly vulnerable during this day to wander and/or be captured by evil spirits. The third day of celebration is called Sangkhan Kheun Pii Mai, the first day of the New Year. It is a time to rejoice, a day to visit relatives and friends, and pay respect to elders by engaging in the auspicious act of sprinkling water on their hands and feet to ask for blessings. Baci Soukhuane ceremonies for well wishes and to “call back” any lost or wandering souls are officiated during this day as well. There are three values associated with the Sangkhan Festival that I would like to discuss. First, it enhances the value of society by bringing families and community together. Secondly, meritorious acts such as charity work or giving alms to Buddhist monks deepens the values of showing compassion. In fact, the Lao word for festival is Boun (Pali: Punna), derivative of a Pali word which means merit. Therefore, by participating in festivals such as the Lao New Year, members of the community partake in the auspicious act of merit-making. Lastly, filial piety, the respect and reverence to family, parents, and ancestors is an utmost important factor in Lao society, and is highly visible during the New Year celebration. This is done through offering gifts to elders as tokens of gratitude and respect, and in return receiving their blessings. These activities also parallel the cleansing and regeneration symbolized by the arrival of rain. The role of Nang Sangkhan (Sangkhan Ladies) makes its presence during the New Year festivities through the reenactment of the myth of how the divine King Kabinlaphom (Brahma) lost his life due to losing a bet with Thammaban (Dhammapala), the Great Sage, and was decapitated. However, he warned that if his head touched the earth, a catastrophic fire would swallow the world, if it touched the sea, the ocean would dry up, if it touched the sky, rainfall would cease it exist. Kabinlaphom instructed his seven daughters to place his decapitated head in a cave on the foot of Mount Sumeru, a place neither of this world nor that of the gods. To pay homage to their father and to prevent the occurrence of natural disasters, every year, one of the seven daughters attend to the decapitated head by cleansing it and leading a procession around the base of Mount Sumeru to show their reverence to Kabinlaphom. The myth of the Nang Sangkhan embodied the values associated with the New Year Festival mentioned earlier. The selfless act of paying homage to Kabinlaphom not only is an example of filial piety by his daughters, but also an act of compassion. In preventing the catastrophic world destruction by Kabinlaphom’s severed head, the Nang Sangkhan serve as protectors of the world, an ultimate act of merit-making. This myth has been re-enacted throughout centuries as part of the New Year festivities, of which a “replica” of Kabinlaphom’s severed head is paraded around “centers” or structures that represent Mount Sumeru (i.e. Temples, villages, sand stupas, etc…). The historical reasoning for instituting the Nang Sangkhan myth with the Lao New Year festivities is quite practical. In an era where the majority of societal members were illiterate, the presence of the Nang Sangkhan provided the populace a glimpse of time and space. Each of Kabinlaphom’s daughters is associated with the days of the week. The specific day and time of the arrival of the Sangkhan Kheun Pii Mai (as determined by the passing of the Sun into the constellation Aries) determines which of Kabinlaphom’s daughters will lead the procession and whether she will stand, sit, or lie down on her chariot. According to traditional Lao calendar based on a lunisolar cycle, certain years consist of two days of Sangkhan Nao. It should be mentioned that the sprinkling of water by young adolescents at one another on the pretext of purifications serves as a courting opportunity for the Lao. Each chariot of the Nang Sangkhan is represented by an animal. These animals should not be confused with the animals associated with Chinese Zodiac signs, of which the Lao was influenced by. New Year greetings your love one. New year greetings. make your New Year Beautiful.